Tour De Max is a fund raiser for the Lance Armstrong Foundation, this was it's second year, held in memory of Max Yonker who died of Breast Cancer. "Starts at mid-peninsula and takes riders through the rolling hills of suburban Menlo Park, Portola Valley, Woodside, and Palo Alto. This ride will again be a very hilly metric century. This year's ride will challenge you with a brisk jaunt up the challenging Page Mill Road! We'll have a rest stop at the top. The ride will proceed down Alpine Road (be CAREFUL on the technical, narrow part of this road!) and we'll have a rest stop at Pescadero Elementary School. Old Stage Road will take you all the way to the coast. 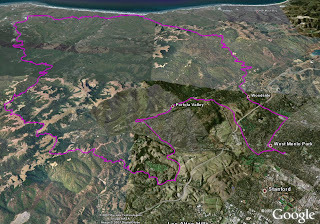 A short ride north on Highway 1 will place us on the 10-mile Tunitas Creek Road climb. This is challenging and beautiful! A fast downhill back to Woodside on King's Mountain Road will put us in good shape for the final rollers back to the start-finish. 7000 vertical feet!" This was my first metric century and the most climbing I had done to date totaling 7,000 feet. The first 13 miles of the ride were very familiar and fairly easy going, up until Old Page Mill Road, over 7 miles of climbing making up for nearly 3000 feet of the total climbing. I kept a steady pace and found another ride at my speed, there is nothing like having a rabbit to chase on a ride. It was foggy as the ride started in the morning but as I climbed up Page Mill further I could see over the fog and it could tell it was going to become a nice day. Their was a rest stop at the peak of Page Mill road, this was my first stop at mile 20. Next was a the decent down Alpine which was a little sketchy at best, I nearly lost it on a turn with lose gravel, though it was a fun decent. After the descent the through route was easy through Pescadero (the second rest stop) till Tunitas Creek. Here is where the tough 10 mile climb began, I ended up pacing with a couple other guys on the hill. When the three of us reached the final rest stop near the top of the hill, we found out there were only 2 other riders a head of us, this meant one thing, the race was on! We all stayed together the remaining mile uphill until we reached Skyline, on the King's Mountain decent it was every man for himself, though I made attempts to break away we all stayed together down through Woodside. I was cranking it as we headed towards Menlo Park, but only managed to break away momentarily before I was caught again. We all reached the finish point at the same time, of course it wasn't really race, but it was one fun ride.